Feel.Fire.Flow. - Is It Summer Or Fall? It Doesn't Matter If The Food Is Good! I bet you were expecting apples and pumpkins. :) All in good time! ...Galore! Available in July, August, September, October and November in the Northeast - but now is prime time due to them being a warm weather vegetable and reaping the growth benefits of the warmer summer months. While green vegetables, especially leafy greens, are arguably the most important to consume multiple times a day, a great way of ensuring you’re getting various nutritional benefits of fruits and vegetables is to be sure you’re enjoying a rainbow of colors. 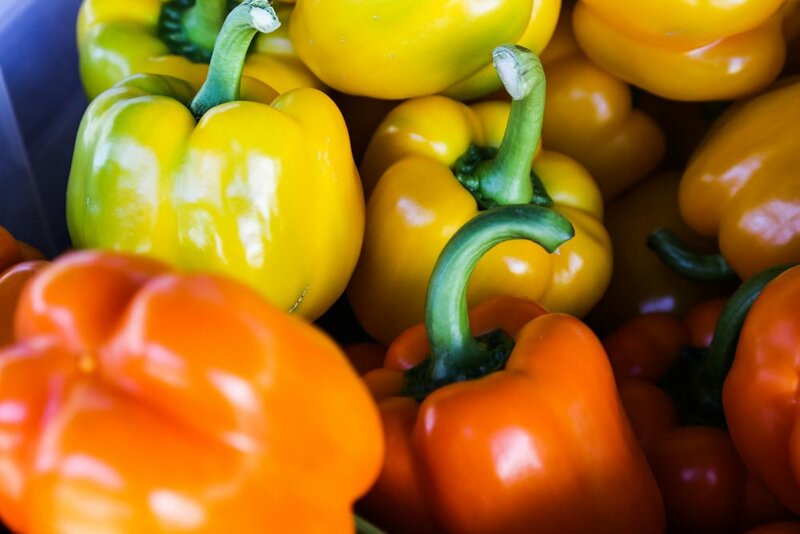 Try incorporating red, yellow, and orange peppers into your meals. Bell peppers of this color indicate primary ripeness and are at their most nutritious - containing much more nutrients than a green pepper. Extremely high in carotenoids, (alpha-carotene, beta-carotene, lycopene, lutein, cryptoxanthin and zeaxanthin), which are plant based antioxidants that help fight off diseases like cancer and heart disease, lower inflammation, maintain eye health, and promote healthy growth and development during pregnancy and youth. High in vitamin C and vitamin A, for immunity function, healthy skin, eyes, and fertility boosting. A solid source of folate, containing 11 - 14% of the daily recommended value, which helps prevent neural tube defects in pregnancy. Vitamin B6 - mood, helps with PMS, hormone regulation, Vitamin E and fiber. Enjoy organic peppers whenever you can (or exclusively if you’re trying to conceive) as they hold onto more of their vast nutrient content when organic and are rated number 11 on EWG’s Dirty Dozen list. Take sausage, peppers and onions to the next level with this recipe from Lexi’s Clean Kitchen, which she suggests trying over spaghetti squash, cauliflower rice, or gluten-free pasta - YUM! Available July, August, and September in the Northeast. You may already be thinking about apple picking, but did you know you can go raspberry picking right now? Wright-Locke Farm in Winchester is one farm North of Boston that is still offering raspberry picking this week. One of “nature’s candies,” with satisfyingly sweet flavor and a low glycemic index, they are a great option to crush your sweets craving. Low in sugar and high in fiber, the perfect combination to stabilize blood sugar. Rich in flavonoids and carotenoids, for disease fighting, beauty boosting, detoxifying benefits. Immune-boosting thanks to their high antioxidant content (up to 50% more antioxidant potential than strawberries!). A good source of immune, mood and fertility boosting vitamin C, folate, B2, B3, and magnesium. Raspberries are also best consumed organic as commercial producers tend use a lot of pesticides on berries in general, and organic raspberries are significantly higher in antioxidants than non-organic. *TIP! If bloating tends to be an issue for you, try consuming berries, and fruit in general, on an empty stomach only. Because fruit is so quickly digested in our systems, if it’s mixed with or sitting on top of other, slower to digest foods it can easily ferment and cause digestive discomfort. Get your omegas and your antioxidants in one with this decadent Vanilla Raspberry Chia Pudding for an on-the go breakfast solution from Not Enough Cinnamon. You can divide the pudding into two separate containers as the recipe calls for, or mix all ingredients in one bowl, cover and let sit in the refrigerator overnight, then divide into as many travel containers as you’d like for storage and grab-and-go convenience. Have you tried any recipes from the local and seasonal food series yet? If so, leave a comment below on how it went! Want more from Feel.Fire.Flow.? Don't miss news about healthful living, coping with pregnancy loss & fertility issues, and living inspiration by filling out the form below to subscribe. Older PostAre You Following Feel.Fire.Flow.? !